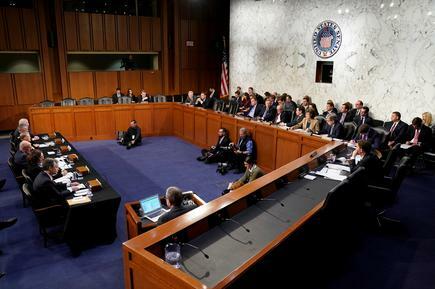 China and Russia pose the biggest risks to the United States and are more aligned than they have been in decades, U.S. intelligence leaders told senators on Tuesday, in testimony that repeatedly contradicted President Donald Trump's statements on global threats. While Beijing and Moscow seek to expand their global reach, Director of National Intelligence Dan Coats said, some American allies are pulling away from Washington in reaction to changing U.S. policies on security and trade. "China, Russia, Iran, and North Korea increasingly use cyber operations to threaten both minds and machines in an expanding number of ways - to steal information, to influence our citizens, or to disrupt critical infrastructure," Coats said. He testified with the directors of the CIA, FBI and other top intelligence officials at the Senate Intelligence Committee's annual hearing on worldwide threats. "Moscow's relationship with Beijing is closer than it's been in many decades," Coats told the panel. The intelligence chiefs' assessments broke with some past assertions by their boss, including on the threat posed by Russia to U.S. elections and democratic institutions and North Korea's determination to denuclearize. Coats also said some U.S. allies are seeking more independence, responding to their perceptions of Washington's changing policies on security and trade, and "are becoming more open" to new partnerships. The officials painted a multifaceted picture of the threat posed by China, as they were questioned repeatedly by senators about the No. 2 world economy's business practices as well as its growing international influence. Senator Richard Burr, the committee's Republican chairman, said the government must work with private companies to foster innovation, while balancing concern about security risks. Many lawmakers have blasted technology companies over the past two years for doing too little to fight the spread of false news reports and other misinformation. The Senate Intelligence Committee is one of several congressional panels, along with Special Counsel Robert Mueller, that have been investigating whether there were any connections between Trump's 2016 and Russian efforts to influence the election. Read more: IP theft: Declining, or just more stealthy? Trump denies colluding with Russia, and Russia denies attempting to influence U.S. elections.